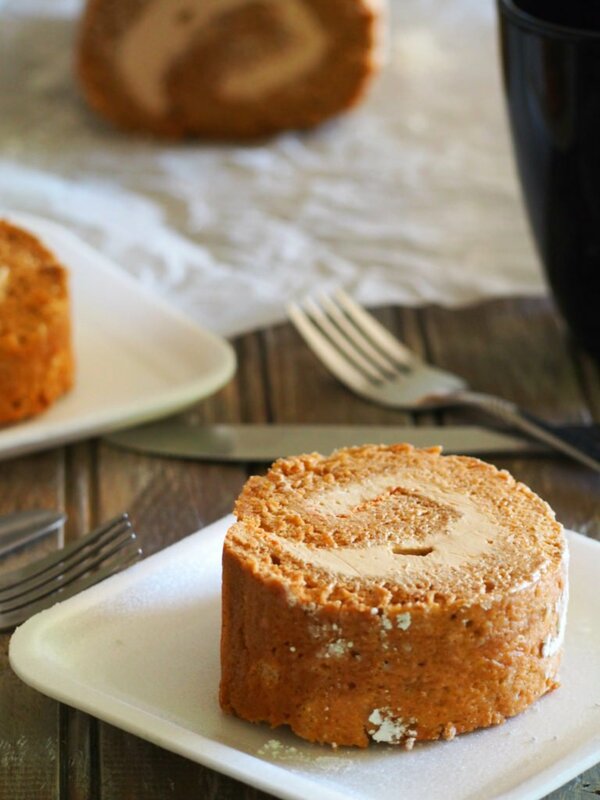 Mocha Cake Roll is one of my favorite cake recipes. The hint of coffee in the creamy Swiss meringue buttercream makes this cake a perfect after- meal dessert or a snack on its own. I have made this cake lots of times already that I regard this recipe as one of my go-to whenever I need to make a cake for an occasion or even just for those ordinary days that I am craving. I guess you can never go wrong with a mocha cake roll. 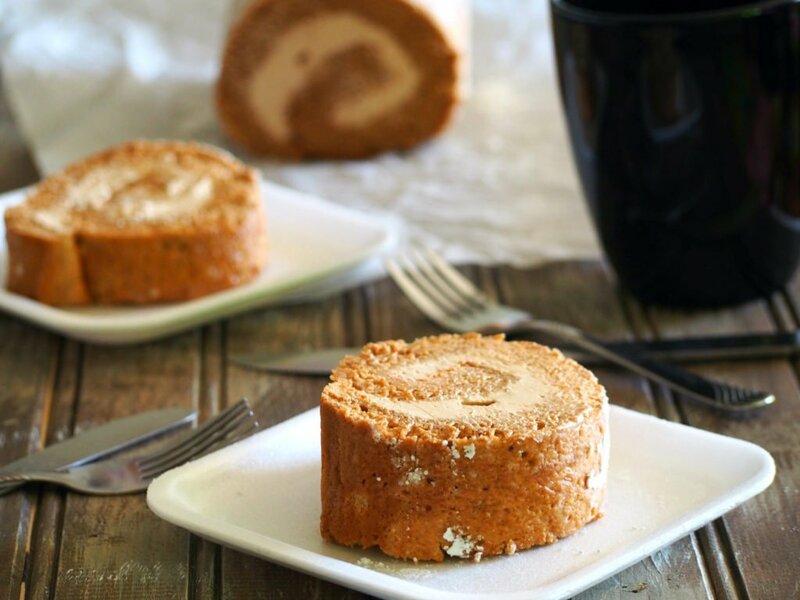 It is lightly sweet yet the buttercream is creamy with a perfect note of coffee. Its the buttercream, it is the mocha Swiss meringue buttercream that always get me! Another nice thing about this recipe is that it requires ingredients that you probably have on hand: coffee, eggs, milk, oil. These are all kitchen staples. The first time I made mocha cake roll, the thing that intimidated me the most is rolling the cake. In this recipe, I used the towel method where after baking, the cake is turned over onto a clean kitchen towel. The cake is rolled together with the towel while it is still hot and then allowed to cool completely that way. update added Sept 30, 2016: I find that another method using a parchment paper works just as well as the towel method. 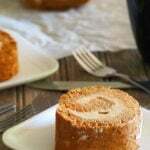 The parchment paper method is what I used in this mango cake roll. 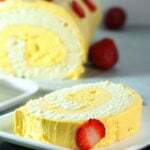 For cake rolls , we use 15 x 10 inches jelly roll pan* to bake the batter. The jelly roll pan should be lined with parchment paper so the cake will not stick to the pan. After baking the cake, and while it is still hot, we turn it over , face down , onto a clean kitchen towel that is dusted with powdered sugar. As you can see in the photo, we peel away the parchment paper from the cake. Then, lifting the short side of the cake , gently start rolling it together with the towel and place the seams down. We let the cake cool inside the towel. Once it is cold to the touch, gently unroll the towel so that the cake is lying flat on the surface again. Start spreading the filling on the surface, avoiding to put too much icing on the sides to avoid them from oozing out when we roll the cake again. After filling the cake, roll the short side again. Start by using the towel to lift the short side , and gently roll the cake inwards, peeling off the towel as you go along. For presentation purpose, I trim a little from both ends of the cake so that they are nice and even. Then I eat the trimmings . Please eat them too. If you are giving the cake away as a gift, this is also a good way to taste the cake without taking from it . 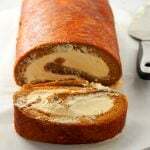 For serving mocha cake roll, I find it better when it is in room temperature, when the frosting is silky soft and smooth. You can also serve this right out of the fridge, but room temperature is my preference. 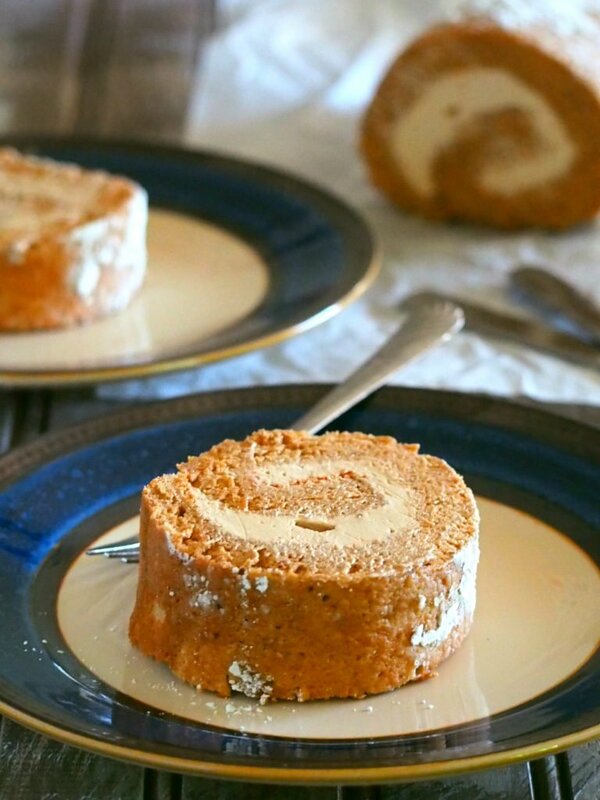 I hope you make this mocha cake roll too. It is comforting and lightly indulgent ! A recipe for a lightly sweet mocha cake filled with the creamiest and smoothest mocha Swiss meringue buttercream. Line a 15 x 10 jelly roll pan with parchment paper. Preheat oven to 370 F.
Sift together flour and baking powder in a bowl and set aside. Whisk the egg whites using high speed of stand mixer. Once frothy, add in the cream of tartar. Once soft peaks form, gradually add the ¼ cup of sugar until the egg whites form shiny, stiff peaks. A good indicator: turn the bowl upside down and the egg whites should not spill or flow. Meanwhile, beat together the egg yolks and sugar using a wire whisk. Once it is thick and light colored, add in the milk, vegetable oil and the coffee . Add in the flour mixture and whisk together until the mixture is smooth. Gently fold the egg whites into the yolk batter in gradual amounts using a rubber spatula. 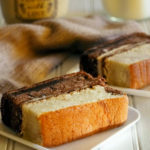 Pour batter into the jelly roll pan and spread evenly to all sides using a spatula.Bake at 370 F for 8-10 minutes or until the cake springs back to the touch. A toothpick inserted unto the center of cake should come out clean. Turn the pan down into a kitchen towel dusted with powdered sugar. The top of the cake should now be facing down.Carefully peel of parchment paper from the cake. Lift the short side of the cake and start rolling it inwards together with the towel. Place seams down and let cool. Gently unroll the towel so that the cake is flat on the surface.Spread filling on top. Using the towel, lift the short side of cake again and roll inwards, let go of the towel as you roll. Trim the edges to make them straight. Fit a heat proof glass bowl on top of a pot with simmering water. Add the egg whites and sugar and start whisking continuously using a wire whisk. Once the mixture turns frothy and white, and reaches a temperature of 160 F, turn off heat. That should take about ten minutes or so. Pour the egg whites mixture into the bowl of a stand mixer fitted with the whisk, and start whisking on high speed until the mixture forms shiny and firm peaks. The bowl should be cold to the touch. Add in the softened butter to the mixer and continue whisking. The buttercream might turn lumpy or might curdle for a moment. Keep whisking until a thick, fluffy icing takes form. Add in the coffee mixture and continue whisking until combined. Store in a tightly closed container or use icing right away. Thank you for being here today! If you want to receive more recipes like this, please subscribe here. *affiliate links. Please see disclosure page for details. It looks so fresh and delicious , brings water in my mouth. I can’t wait to make it at home . Hope me and my family will definitely like this. You will love this, Zubia! how do i make this recipe mocha flavor? Hi Ria! I just used the instant coffee powder to make this cake mocha flavor 🙂 Thanks! I hope you enjoy this! How can I make the mocha cream mixture? what did you use in it? Too easy to bake. I just loved it. 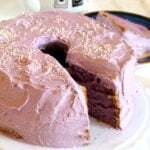 please share chocolate or oreo cake recipes as well. Hi Keema! Thank you! I will definitely try versions of those! Thanks! But could you tell me about the butter ? Hello! The butter should be 113 grams. Enjoy! Hello! I just separate 4 eggs for the first part of the recipe. Then for the buttercream, I separate 2 more eggs to get two whites. You will have an excess of 2 yolks because yolks are not needed to make the buttercream. Thank you and happy baking. I found the mix rose too much and when I tried to unroll it due to its thickness I think it split. 1/2 tablespoon baking powder??? Most other recipes for roll batter don’t use any? Other than the fact it fell apart and was held together by the buttercream…totally yum. Thank you for trying the recipe, Donna. I am happy that you liked the taste. I am so sorry that the cake split. It happens to me sometimes, too. Hello, Jealyn. I used granulated white sugar for the buttercream. Thank you and happy baking! ❤❤ Enjoy!